Once upon a time, Florida paid Idaho $975,000 for a game to presumably begin the 2014 season but didn’t make it past the opening kickoff thanks to a lightning storm. The Vandals and Gators agreed to play again for a separate paycheck three years later, but Idaho backed out of that deal, opting instead to take $1.3M from Missouri. The two schools finally managed to meet on the football field in 2018- and 1,540 days later than they initially intended to, Florida finally got to enjoy the beatdown of Idaho that they paid for. And they got it started quicker than they’ve ever started a football game before. 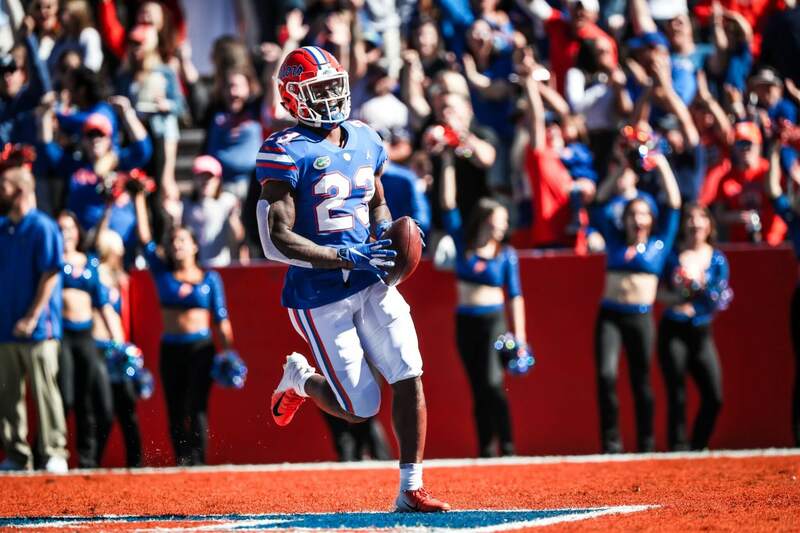 The game was a mere six seconds old when Chauncey Gardner-Johnson was trotting into the end zone with a pick six on a ball Mason Petrino should never have thrown. That was the first highlight the Gators created on a day filled with them in a 63-10 Senior Day romp of Idaho. The win puts the Gators at eight wins on the year- twice as many as last year- and a ninth next week could put them in a New Year’s Six Bowl. But those kinds of thoughts can wait until next week. Today was more about embracing the program’s seniors, as well as getting an extended preview of the future. And of course getting their money’s worth out of the Vandals. Just two minutes of game clock after the pick six, Feleipe Franks casually trotted into the end zone on a 17 yard quarterback keeper. Later in the quarter, Franks hooked up with freshman Kyle Pitts for a 54 yard score to make it 21-0. And before the period was over, Franks picked up his third touchdown with a simple three yard toss to Mississippi transfer Van Jefferson to make the score 28-0. The second quarter featured more of the same. Josh Hammond got in on the fun with a 21 yard touchdown run on an end around, and Franks closed his day with a 34 yard strike to Tyrie Cleveland before ceding his spot to freshman Emory Jones for the duration of the game. Jones was 12/16 for 125 yards and two touchdowns in the third game of the four that the NCAA allows him to play without burning his redshirt. Despite the 63-10 score, Florida wasn’t perfect. Franks missed teammates on a pair of deep balls that, had they been thrown accurately, would have been touchdowns. The Gators also got stuffed on a fourth and one inside the Idaho five. And with only 1:22 remaining, Dan Mullen was visibly irate about not getting enough players onto the field in time. Little else went wrong for the Gators, though. On the contrary, today served as a bright light into the future as Jones was just one of several youngsters who got their names in the stat sheet for the first time. Freshmen receivers Jacob Copeland, DaQuon Green and Kyle Pitts got their feet wet with a reception each, with Pitts’ going 54 yards for a touchdown, while freshman tailback Iverson Clement picked up twelve yards on three carries. And on defense, Zach Carter came off the edge to swat down a pair of passes and linebacker, while Ventrell Miller picked off a wounded duck and raced 83 yards for a pick six. Florida now takes the confidence they built into Tallahassee to attempt to shut down the Seminoles’ five game winning streak in the series. If they can do so, they will touch off a party that dwarfs the one they enjoyed today.